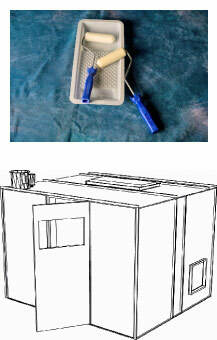 An enclosed dust free room or spray booth (such as the one diagrammed, right) is highly recommended. Low humidity will accelerate evaporation, decreasing drying time. High humidity slows down evaporation increasing drying time. *Tip Since Eco Print Shield is a water based product dilution will be dependent on your relative humidity and room temperature. The lower the humidity the more you will need to dilute it to a maximum of 20%. 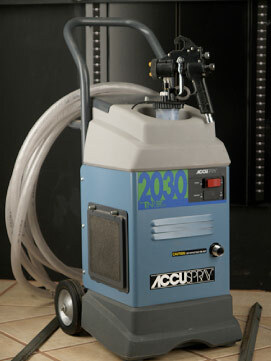 Complete kit – The kit comes complete with an Accuspray #10 gun and a turbine. The turbine, pictured on next slide, does not compress air, so water condensation is not a factor. Gun and regulator – If you already have an air compressor, you can use the Accuspray #12 gun, which must come with the pressure regulator. Please refer to the manufacturer’s instructions on proper setup of this system. Both set ups need to be configured with a 43 or 1.1mm fluid tip and nozzle and an aluminum #7 air cap. Note: When using a compressor, an in-line water filter is needed to remove any water from the air lines. Use of gloves, long sleeves and respirator is recommended. Have exhaust fan turned ON. It is important to have adequate lighting to see where coating has been applied. Proper spray technique is very important to achieve a good finish. Always spray at a distance of 6 to 8 inches from your target. Keep the gun vertical and parallel to your target throughout each entire pass. Make sure that your wrist remains firm during each pass. 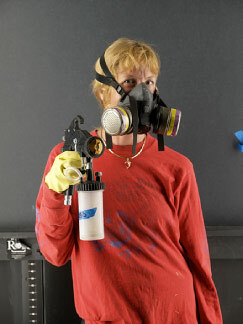 More detailed spraying can be done with the gun tip as close as 2 inches from your target. Trigger the gun only after your pass begins, and release the trigger before stopping your motion. Do not angle your gun upward or downward while spraying. Angled spraying will develop an uneven paint buildup. Overlap your passes approximately 50% for an even finish. The normal fan pattern shown is achieved by opening the fan adjustment, triggering the gun, and maintaining a distance from your target of 6 to 8 inches. The small round pattern shown can be achieved by closing down the fan adjustment, triggering the gun lightly, and maintaining a distance from your target of 2 to 4 inches. The first coat should be a thin coat to start the sealing process while allowing sufficient drying time. The coat should be evenly applied with the dark areas appearing just milky white. The photos below show a perfect application over a grayscale print. Too much spray will yield an opaque white, and may streak and bubble. 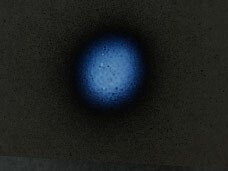 Test the spray pattern on dark paper before spraying the print. 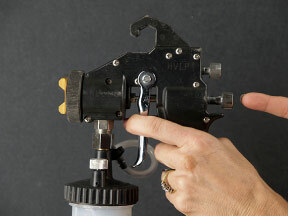 Adjust the fluid control and fan adjustment screws until you have a pattern that will not run when gun is 6” to 8” from the surface to be coated. Make sure gun is spraying a normal fan pattern as shown above. 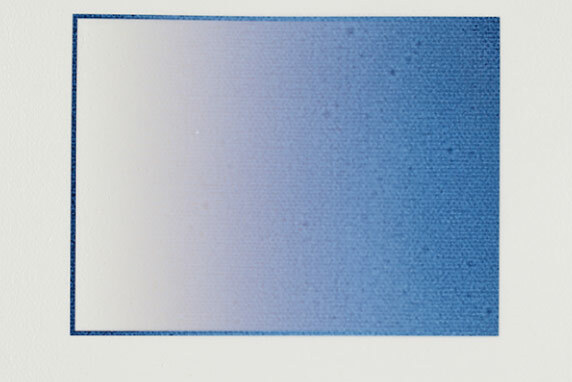 Start in the upper or lower left corner and spray in a HORIZONTAL direction to the right with 50% of the spray overlapping the print as shown here. Over spray the end of the print, then return to the left with 50% overlapped on the first pass and with 50% on the untreated media. Repeat overlapping pattern until the whole print is sprayed. *Alternative: Spray 2 passes at start and end, with 50% overlap on all other passes. Dry completely, when coating becomes clear. Higher humidity will take longer. The next coat can be applied when the first coat is dry to the touch and the translucent milky white appearance has turned clear. Cracking indicates the need to apply an additional coat. 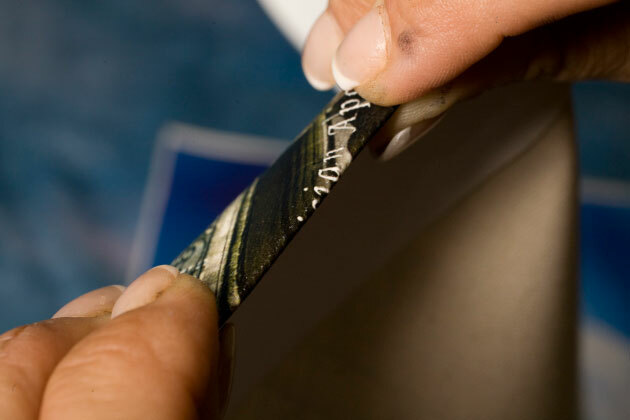 The main objective is to get even coverage over the entire surface of the print. The spray pattern may be changed from horizontal to vertical. See below. Start in the upper left corner. Spray in a VERTICAL direction down with the 50% of the spray on the print and 50% overlapped over the edge. Return to the top with 50% overlapped the first pass and 50% on untreated (once coated) media. Repeat until the whole print is sprayed. Dry completely, (when coating becomes clear). Higher humidity will take longer. The next coat can be applied when the second coating is dry to the touch and the milky white appearance has disappeared 20 minutes minimum. In the spray booth, a shelf arrangement – such as the one pictured left – will allow the clean, safe storage of many prints in process. When working with such shelves, always place newly-coated prints below already-drying prints. If the prints will be stacked or stored (i.e. the coated surface is in contact with another surface), the prints must be interleaved with white foam (astro foam), otherwise surface sticking will occur. Tip: Interleaving with Astro-Foam prevent the prints from sticking, as long as prints are dry. 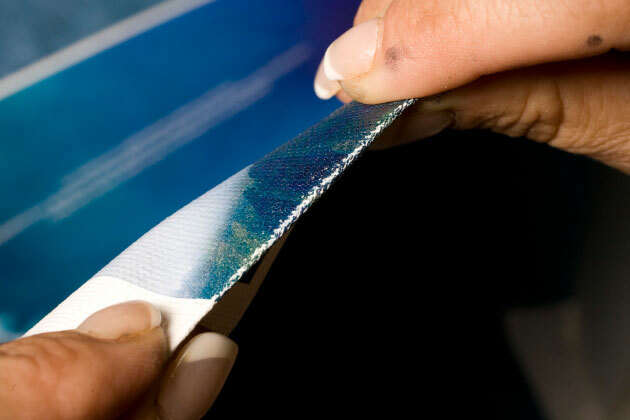 Eco Print Shield has elastic properties to prevent prints from cracking. 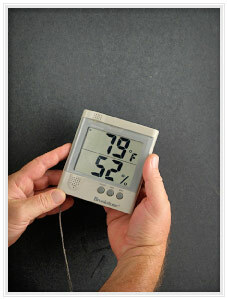 Drying and curing is dependent upon relative humidity and environmental temperature. 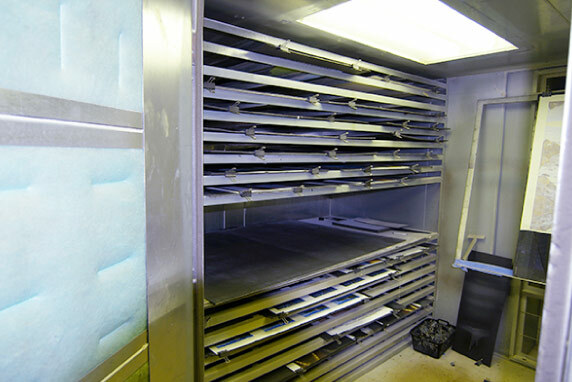 Another option for stacking and drying are screen printing drying racks. Framing or stretching Prints are about 85% dried after 24 hours at 50% RH. As soon as coating becomes clear, the prints can be framed or stretched. Stacking or storage If the prints will be stacked or stored (i.e. 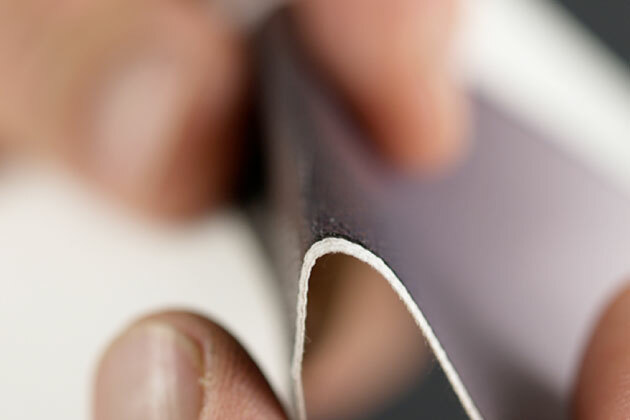 the coated surface is in contact with another surface), the prints must be interleaved with white foam (astro foam), otherwise surface sticking will occur.